When it comes to building healthier communities we all have a role to play. Partners from different sectors have different types of expertise and resources to contribute. Collaboration can make all the difference because it draws from the strengths of, and can mobilize the assets of, diverse contributors. 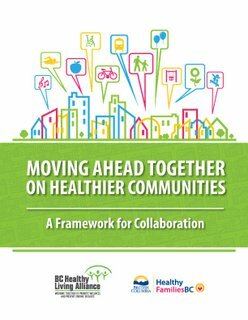 This 2015 Framework Moving Ahead Together on Healthier Communities builds on consultation processes, done in partnership between Healthy Families BC, BC Healthy Communities Society and the BC Alliance for Healthy Living, to explore collaboration between NGOs, health authorities and local governments and how connections could be strengthened. This 2015 Primer Moving Ahead Together On Healthier Communities is for NGOs that want to engage with local governments on healthier communities but need guidance on where to start. It is intended to help NGOs understand how local governments work, how to make connections and how to engage with local government processes. Exciting changes happen when knowledgeable, interested people come together to solve problems or make improvements at the local level. Non-governmental organizations (NGOs), health authorities and local governments are natural partners because of their shared interest in creating thriving communities in which people are healthy and able to live to their fullest potential.